After Christmas; you may get a new iPod (iPod touch or iPod Nano) as a present, and you also got an older iPod, you want to transfer music from iPod to the new iPod, so you can save tons of money from double purchasing the songs on iTunes store, here is a step by step guide will teach you how to do that. Part2. How to copy music from iPod to computer and iTunes. 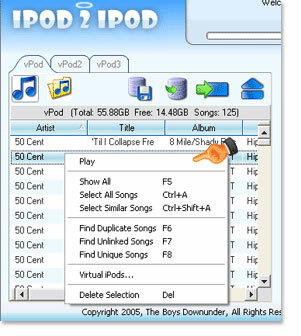 The tool you need is iPod 2 iPod, iPod 2 iPod will detect and automatically close iTunes, so please don’t run iTunes while you are using iPod 2 iPod. Step1. Download and install iPod 2 iPod, run it. Connect your first iPod device via either USB/Firewire connectors. It will take iPod 2 iPod approximately 15 seconds to auto detect then display the music from your first iPod. Your first iPod is identified as a ‘tab’ on both the left and right sides of the screen. Step2. Use the “Right Click” menu to carry out a range of actions on the individual song tracks. To initiate this menu place the cursor over the music list and click on your right mouse button. Play Enables you to listen to the currently selected track. Show All Shows all music on your iPod. Useful when viewing songs within playlists. Select All Songs Selects all music within the song list. Select Similar Songs Selects all songs matching the text in the first column. Find Duplicate Songs Finds duplicate music on your iPod. You will be given the option to clean-up any songs found, freeing up space! Find Unlinked Songs An annoying issue in iTunes, the “Unlinked Songs” function helps discover music titles which are no longer associated with the actual music file. Find Unique Songs Compares the iPods in the left and right panels, and displays the songs which are on one iPod, but not the other! Delete Selection Removes music no longer required. 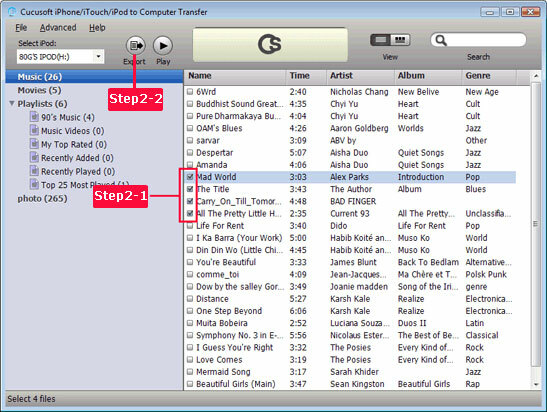 Select the songs you wish to transfer and either drag them to the destination panel, or click on the “arrows” to transfer music from one iPod to another. It is easy to end up having duplicate songs on your iPod, iPod 2 iPod tracks these duplications and allows you to remove them in seconds. It also optimizes storage space on your iPod allowing you to store more songs! Sometimes, you lost your iTunes library, or your computer crashed and you have to format your computer, but the songs and movies are still on your iPod, you may want to copy them from iPod back to computer. And this part will help you. 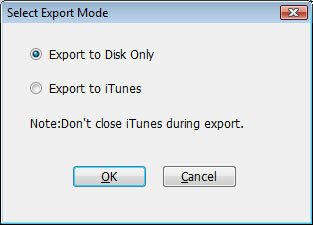 The tool you need is iPod to computer transfer, It also supports iPhone. Before you run our program, please be sure you have installed iTunes on your computer. Step1. 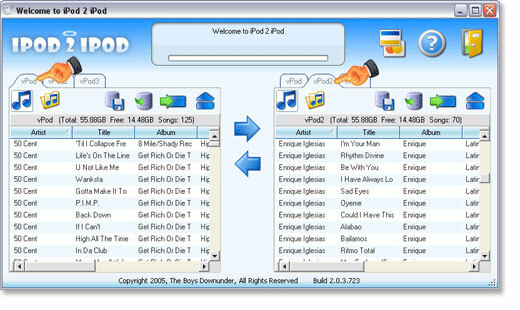 Download and install iPod to computer transfer, after your iPhone/iPod connected to pc, Launch the program you will see the right UI. Normally, the program will search the device automatically; the files (songs/movies/pictures) will be shown in the list. Step2. Choose the list and files you want to transfer, Click the Start Transfer button. Step3. After you clicking the Start Transfer button, the following window will pop up; you can choose transferring to computer or iTunes directly. You can set the output fold at settings option before transferring. Done. If you are Mac user, you may try this Mac iPod to computer transfer, the operation steps are similar to the windows version, so I’m not repeating here. For more iPod Transfers, you can refer to this side-by-side iPod Transfer Review.